Flicker Alley is proud to present the following essay by Vince Keenan, written for Detectives and Dames: A Flicker Alley Noir Blog-a-Thon! 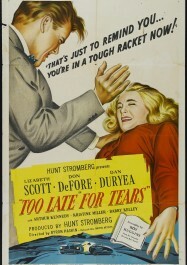 Too Late for Tears (1949) is available on Blu-ray/DVD May 10! Pre-order today! Vince Keenan is the managing editor of Noir City, the magazine of the Film Noir Foundation. His new novel Design for Dying, co-written with his wife Rosemarie Keenan under the pen name Renee Patrick, was called “a champagne-flavored frolic of a first mystery … sure to delight fans of old Hollywood and Turner Classic Movies” by Library Journal. You know the work of Roy Huggins, even if you’ve never heard his name. 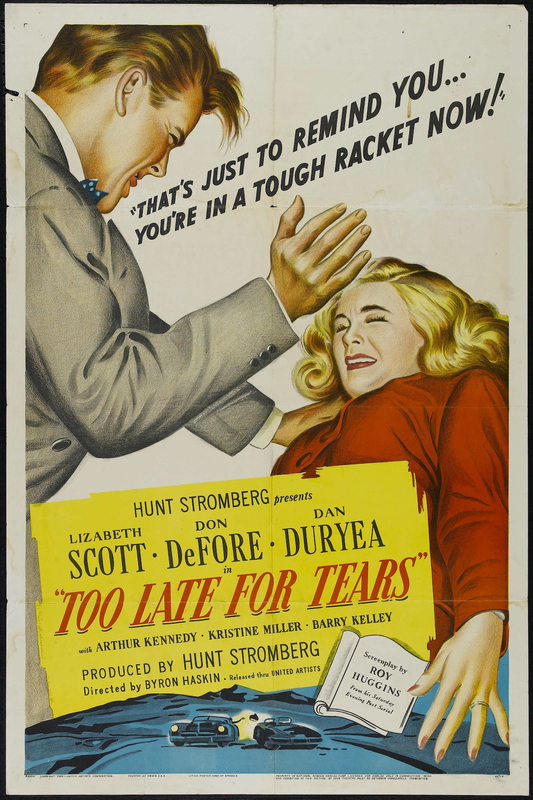 Huggins, who wrote both the screenplay for the newly-restored Too Late for Tears (1949) and the serial on which it was based, is one of the stealth giants of 20th-century pop culture, leaving his fingerprints everywhere. He’s the Stan Lee of network television. Huggins’ name came to mean something else inside Hollywood’s corridors of power. He’d gotten shafted on a number of shows he created, the most legendary example a story that sounds like something out of Hail, Caesar!. Studio chief Jack Warner arranged for the pilot episode of 77 Sunset Strip to be released theatrically in the Caribbean, a dodge enabling the studio to claim the series was based on a movie and not Huggins’ original Stuart Bailey stories. Fed up, Huggins had ownership of all the concepts he created written into his contracts, a practice other producers soon followed. What cements Roy Huggins’ Hall of Fame status is his work as a mentor, with one writer in particular. TV titan Stephen J. Cannell (The A-Team, Wiseguy, 21 Jump Street) called Huggins “my Godfather in this business,” saying “during the two-and-a-half years I sat in his office, or in screening rooms, or at lunch discussing script problems with him, I learned more about the process of writing and producing television than I have in the entire twenty years since … He was the one who showed me how to do it. He was the one who taught me how to fix a bad piece of film or plot a script so each scene is more interesting than the one that came before it.” Together, Cannell and Huggins co-created the perennial The Rockford Files, re-teaming Huggins with Maverick star James Garner. Many of today’s top television auteurs came through Cannell’s system, filtering Huggins’s storytelling lessons through to an entirely new generation.